Today I am going to show you the finished dress I made using my recent tutorial for a gathered neckline. I made the dress using fairly heavy textured jersey fabric that I bought in Bali. The dress is a loose-fitting, long-sleeved style which finishes above the knees. 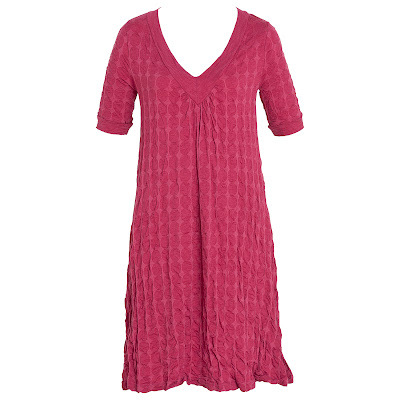 This is such a comfortable, flattering and forgiving style as it skims and lumpy bits (!) and the sleeves balance out the proportions nicely. So nice to wear with leggings and boots on a cold day. I was inspired by this Metalicus 'Saucer tees' dress. It retails for around AU$170. I am so happy with my version, which I made for under $10. I drafted the pattern myself from a combination of other dresses and tops which fit me well and had the style I was looking for. I cut the pattern out to allow for the gathered neckline as I showed in this tutorial. Then I finished off the raw edges (neckline and cuffs) with fold-over elastic (FOE) that I had bought on ebay. I stitched the FOE down on the right side with a narrow zig-zag. You can also use a straight stitch close to the edge as long as the elastic doesn't need to stretch too much in that area (stretch it a bit as you sew a straight stitch to help with this). I cut the elastic approximately 3/4 the length of the neckline and stretched it to fit. This technique prevents sagging of the finished elastic. I finished the lower hem by folding and using a straight stitch. It really turned out beautifully. Love that FOE - have never seen it before; will have to give it a try. Looks great on you, too! Thanks so much for your comment. Once you use FOE you'll be addicted - trust me!